What if Mike McCardell--beloved reporter of glasses half-full and the brighter side of life--is actually dead... or, more specifically, un-dead? Suppose he has continued to walk among the living ever since he was a sapper with the famous detachment of Royal Engineers who came to British Columbia in 1859 and was known as Jock Linn--the namesake for North Vancouver's misspelled Lynn Creek. And then imagine that after Linn died or, more accurately, didn't die when everyone thought he did, he needed an eternal job and decided that the easiest way to make a living was to be a reporter. What you have is Haunting Vancouver, likely the most laughable, laudable and accessible telling of the area's inception and development, all drawn from Linn's conversations with a variety of its early co-founders. Embark on a rollicking tour of Vancouver history where you'll meet the "Gassy" personality of saloon-owner Jack Deighton, learn of the expensive mistake once made by logging entrepreneur Edward Stamp, and be paddled in a boat by Pauline Johnson as she mulls over the name she should give to her favourite place: Lost Lagoon. Discover inspiring stories of the people who shaped the landscape of the city--athlete and oddball Seraphin "Joe" Fortes (no, he didn't own a restaurant), the openly gay politician, A.E.B. Davie, who inspired today's celebrated gay district, and China-born Chang Toy, the Vancouver businessman who rebelled against racist city planners and built the famous Sam Kee Building in Chinatown, the narrowest commercial building in the world. 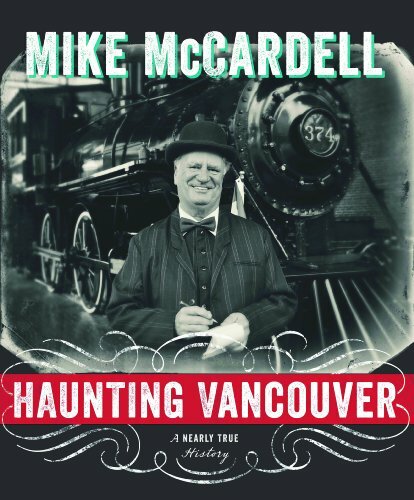 Haunting Vancouver is unmistakably Mike McCardell--with the same tongue-in-cheek humour, narrator Jock Linn brings folks back from the dead and delivers a fascinating local history that re-inspires a love of Vancouver and a new appreciation for all that it took to build Lotusland. And it's all true... well almost. Mike McCardell has earned the loyalty of hundreds of thousands of fans for his investigative reporting and human-interest stories. He is the author of the bestselling essay collections Unlikely Love Stories, Here's Mike, Chasing the Story God, Back Alley Reporter, Getting to the Bubble, The Expanded Reilly Method, The Blue Flames That Keep Us Warm and Everything Works, the local history book Haunting Vancouver and the memoir Cardboard Ocean.